Tornadoes swept across northeast Texas yesterday afternoon. Widespread damage and numerous injuries have been reported, but luckily no fatalities. So far, the National Weather Service has confirmed that eleven twisters touched down in the Dallas-Fort Worth metroplex, the ninth-largest metropolitan area in this country. The strongest storm in this outbreak was rated an EF-3 on the Enhanced Fujita Scale. 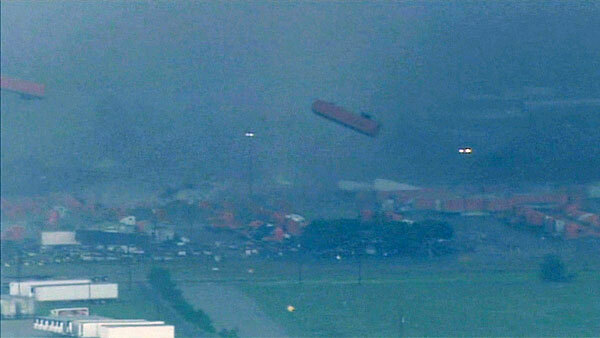 It tore through the Dallas suburb of Forney, TX with winds of up to 150 mph. Video taken during this outbreak shows the incredible power of a tornado’s winds, both horizontal and vertical. The footage of 8-ton tractor-trailers being lifted over one hundred feet in the air and tossed around like toys is unforgettable. It is sadly coincidental that this devastating storm occurred on the anniversary of the Super Outbreak of 1974, the most violent tornado outbreak in U.S. history. This entry was posted in weather and tagged extreme weather, national, storms, tornadoes by Melissa Fleming. Bookmark the permalink.